Stylish waterfront home with an incredible unobstructed view of the Mediterranean Sea , yachts and Myconos's top hotel the Santa Marina. Located in a luxury gated community. Walk to the private beach or Olympic sized private pool* with beach bar. Enjoy great Myconian food at the taverna*, free tennis courts, basketball and playground, all set in lush private gardens. Costa Ilios is totally car free and safe for children to roam free. The beautifully decorated house is 90 square meters, on 3 floors with 3 bedrooms and 2 full bathrooms, a fully equipped kitchen, washer dryer, fridge, cable TV and internet. The house does NOT have air conditioning it has ceiling fans in all rooms except the small bedroom where there is a standing fan. Linen and cleaning service is provided every 4 days included in the price. Food delivery is available. Our house is situated in the resort of Costa Ilios near Ornos on the South West of the island. Just a 7 minute drive from the main town and the airport on an easily accessible road (this is an important distinction for Mykonos!). Ideally located for tranquillity whenever you wish for it, and all the buzz, nightlife and restaurants Mykonos has to offer. Costa Ilios is not close to public transportation, and taxis are not reliable in the summer season. To enjoy the house and the island we STRONGLY recommend having your own transportation car or motor bike. (Push bikes are not useful, the roads are very steep). * Opening of the community pool and taverna are subject to contract. No discount will be given if these amenities are unavailable. I have been coming to Mykonos since the early 80s, I raised my children here and loved the enduring bohemian spirit and desert beauty of the island. We gravitate towards the authentic unspoiled places where you can relax and enjoy the aesthetic natural beauty. We dip into the cosmopolitan trend setting aspect of the island whenever we want to a part of that too. This is also what our house offers inside the vibrant Mykonos scene at a relaxed distance. Well maintained, stylish home, in a unique setting with a private beach and an unobstructed waterfront view. Yes linens are provided and changed every 4 days. Free parking on 2 large parking lots on the premises. Yes Towes are provided and changed every 4 days. These are for use inside the house only, NOT BEACH TOWELS. There are two dining areas. One inside the house and one on the terrace. We mainly use the one on the terrace. Terrace with built in dining table and chairs and lounge chair. There is a tennis court and basket ball court available in the resort for guests to use. Pool opens May 1st, in the unlikely event that the pool is closed for repairs no refunds are available. THE HOUSE IS ATTACHED TO OTHER HOMES. WE ONLY ACCEPT GUESTS THAT ARE QUIET AND RESPECTFUL OF THE NEIGHBORS. ANY NOISE COMPLAINTS WILL LEAD TO TERMINATION OF RENTAL AND YOU WILL BE ASKED TO LEAVE THE PROPERTY. Had the best time place was amazing views stunning and the gentleman that owned the resturant was so helpful would differently returned we stayed here as our son got married at hippie fish just down the road. very nice stay. enjoyed with family of 5 for 5 days. Vicky's unit is as stated. we had a great time and it is beautiful view. William I am so glad you enjoyed our house, it was a pleasure to host you. Picture perfect location with great little private beach. Safe, clean and classic Greek unit. Nice people who own and maintain the property. Shopping, dinning and fun all night long at the Old Port harbor nearby (during the summer season) was something we have never seen. Can’t wait to come back! Fantastic stay at Vicky's villa near Ornos. Brilliant views across the bay watching the boats and lovely scenery. The villa is in a great location if you want the balance of a quiet location during the day and the night life of Ornos, Mykonos town or St Johns a car taxi or bus ride away. The villa has all the facilities in typical Greek style and the private beach is superb for lazing, swimming and snorkelling. However it was end of season and very quiet so the on site shop and taverna weren't operating. Bonus if your a Shirley Valentine fan you can go to see the film locations at St Johns and the Hippy Fish for a great meal. Enjoy !! Thank you Andy Iam so happy you enjoyed your stay. Many insiders think the best season in Myconos is May and late September early October that's when we enjoy it the most. We love Hippy Fish too! Great place for friends and families! We (4 adults and a child of nearly 2 years) had a fantastic holiday in this beautiful apartment. Everything was perfect and we enjoyed our stay and the fantastic seaview very much. Especially the private beach was very suitable for families with children. Also the check in and check out was smooth and professional. Many Thanks to Vicky and Margarita !! Thanks Tobias we look forward to seeing you again. Very pretty resort located a 5 minute drive from Ornos with a large communal pool, its own private beach, taverna and mini market (both sadly not open yet during our stay). The property has a beautiful outside space in front with a gorgeous view of the bay towards Ornos. The seating area inside is not very big but it didn't feel cramped for our family of 5 and it was well appointed and welcoming. Communication with the owner was excellent and the local staff was helpful and polite. Would wholly recommend! Stylish, self contained waterfront house in Mykonos, perfect for up to 5 people or a family. We have a private community beach and pool. Wonderful location for a family vacation. Our house is in a gated community is on a peninsula across the bay from the legendary Santa Marina Hotel -a nice place to visit for a drink. 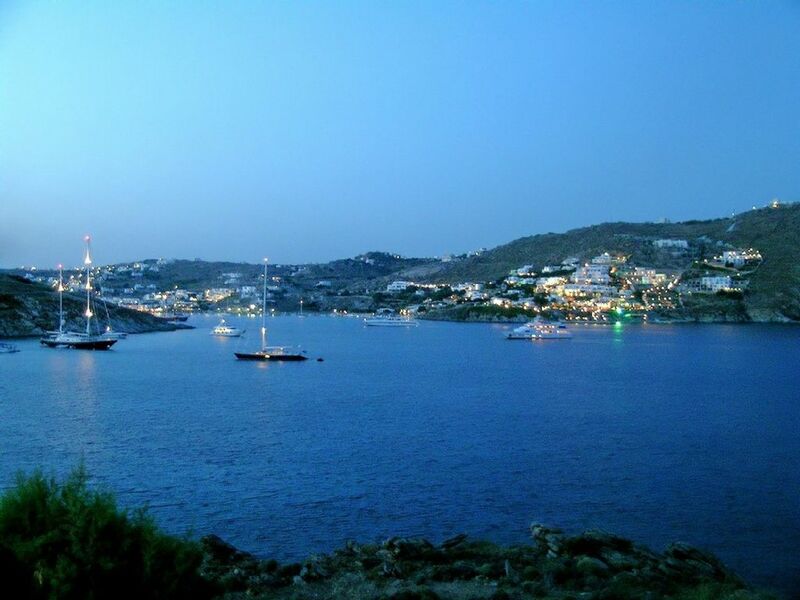 Our favourite pastime is to sit on the terrace at the sunset and watch the yachts floating in and out of Ornos bay. There are lush gardens surrounding the house and no cars. if you don't feel like going out there are many local restaurants that deliver. Ornos has a supermarket, butcher, dry cleaner and the famous 24 hour Ornos bakery. $500 security deposit, fully refundable at the end of your stay The price may vary by number of people. Payment is 100% before occupancy.